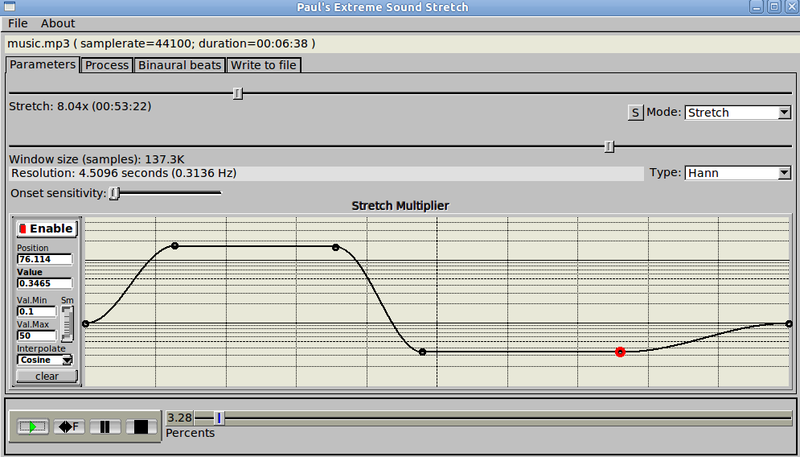 Whether you enjoy making music on the experimental side of electronica or would find a means to effortlessly create long evolving soundscapes out of almost any audio material to be useful, then you simply MUST try out: Paul’s Extreme Timestretch (aka Paulstretch)! Paulstretch is a cross-platform freeware project developed by Paul Nasca. It will let you even stretch audio 1000 times its original length (make sure you have enough free hard drive space before you try that). To perform such extreme time stretching without nasty sounding audio artifacts is beyond the possibilities of stretching algorithms of DAW applications. Granted its user interface is dated and very clunky (in particular the file loading dialogues will cause a little frustration) however the results of stretching audio by even the most extreme amounts make it worth getting to grips with. For my first experiment, I imported Icehouse’s 80s hit, “Man of Colours” and stretched it 32 times its original length (with all the default settings with the exception of the stretch amount) and enjoyed an entire afternoon of blissful listening from a tune originally only 3 minutes in length. I could hear every syllable of the lyric evolving over half minute periods of spectacular soundscapes. The creative applications for this tool are fantastic in my humble opinion. Create lush evolving synth pad sounds by taking a snippet of audio between the beats of a favorite tune then import it into your favourite DAW based sample player (I LOVE Ableton’s Sampler instrument for this) and further refine it into a instrument playable on your MIDI keyboard and add additional filtering or modulation effects (and of course generous amounts of delay). Or perhaps, grab a melodic synth riff you’ve written in your DAW, bounce it out as an audio stem, stretch it 16 times in Paulstretch then import it back into your project for some spooky ambiances in the key of your tune that extend for its entirety (bonus points if you create a duplicate copy of it pitched up +7 semitones and offset slightly to create a canonizing layer). Heck, go one step further and insert some FSU plugins such as those from Glitchmachines I blogged about yesterday to add further sonic interest. Give it a spin for yourself – I guarantee you will not be disappointed! Everything you needed to know but were afraid to ask concerning adapting balanced and unbalanced audio connections. Want a free library of 500 kick drums samples labelled with music keys?